In August 1863, during Kit Carson's roundup of the Navajo, Santa Fe's Provost Marshal, Major Joseph Cummings, is found dead in an arroyo near what is now the Hubbell Trading Post in Ganado, Arizona. The murder, as well as the roughly million of today's dollars in cash and belongings in his saddlebags, is historically factual. Carson's explanation that he was shot by a lone Indian, which, even today, can be found in the U.S. Army Archives, is implausible. Who did kill Carson's "brave and lamented" Major? The answer is revealed in this tale of a group of con artists operating in 1861-1863 in the New Mexico and Arizona Territories. As a matter of historical fact, millions of today's dollars were embezzled from the Army, the Church, and the New Mexico Territory during this time. In this fictionalized version, the group includes the aide de camp of the Territories' Commanding General of the Union Army, a poker dealer with a checkered past in love with one of her co-conspirators, and the Provost Marshal of Santa Fe. It is an epic tale of murder and mystery, of staggering thefts, of love and deceit. 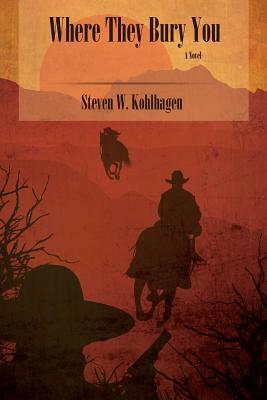 Both a Western and a Civil War novel, this murder mystery occurs in and among Cochise's Chiricahua Apache Wars, the Navajo depredations and wars, Indian Agent Kit Carson's return to action from retirement, and the Civil War. The story follows the con artists, some historical, some fictional, during their poker games, scams, love affairs, and bank robberies, right into that arroyo deep in the heart of Navajo country. STEVEN W. KOHLHAGEN is a former economics professor (University of California at Berkeley) and Wall Street investment banker. He is the author of innumerable economics publications, and he and his wife, Gale, jointly published a murder mystery, "Tiger Found." He divides his time between the New Mexico-Colorado border high in the San Juan Mountains and Charleston, South Carolina.